Mac OS X 10.6.8, a point release for Snow Leopard, has been released. This update fixes several issues and readies the built-in Mac App Store for the Mac OS X Lion upgrade processor, once it comes out next month. According to Apple’s support page, this update addresses issues related to the stability, compatibility and security of Mac computers. Aside from all security updates that were released since 10.6.7, including the MacDefender fix, people familiar with this update say this patch addresses issues related to AirPort, Graphics Drivers, Mac App Store, Networking, QuickTime and VPN. More importantly, this update makes changes to the Mac App Store to prepare it for Mac OS X Lion, once it comes out sometime next month. Lion, the next version of Apple’s operating system, will no longer be distributed on DVD and will only be available from the Mac App Store. Once purchased, the operating system is downloaded as a single executable that will then upgrade any Snow Leopard machine with ease, similar to how any other application with a setup wizard would be installed. The Mac OS X App Store was first made available as part of the Mac OS X 10.6.6 update, released earlier this year. The new Mac App Store model allows for the distribution of Apps developers have come to love (or hate) from the iOS platform. Unlike iOS, however, Mac OS X still allows for distribution outside the App Store. Updating to Mac OS X v10.6.8 or later is strongly recommended when using Final Cut Pro X, Motion 5, or Compressor 4. Since Lion is so close to being finalized, I think it’s safe to say that this will be the last big update for Snow Leopard. Apple is known to only work on point releases for the last version of its operating systems, and only releasing security updates for them afterwards, although final updates tend to be larger than usual. Once Lion hits the App Store, Snow Leopard will be automatically be moved to a security update-only support mode, before being completely discontinued shortly after. 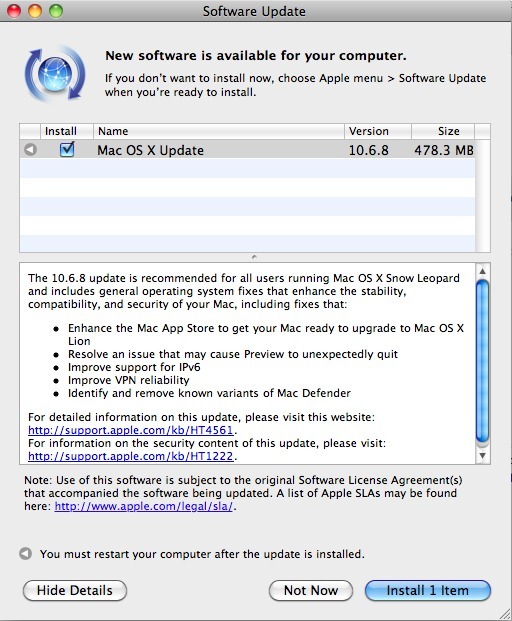 All Snow Leopard users are urged to get this update free of charge from Software Update or from Apple’s Support Page. It will likely be required for the Lion upgrade, which will be available for a small price tag of $29, next month.